It is now illegal for retailers of any kind to display tobacco products, with a ban applying to small shops from this week. 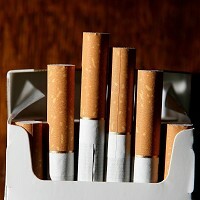 Larger-scale retailers and supermarkets have not been able to display cigarettes for three years. But the Action on Smoking and Health (Ash) campaign group says the latest ban is another leap forwards in the fight to stop people smoking, ahead of standardised packaging next year. Smoking can cause several life-threatening conditions, including lung cancer and heart disease. Anyone suffering from them would be wise to arrange specialist medical travel insurance when they go overseas, in case they need treatment. Putting tobacco out of the sight of young people is crucial as two in three smokers pick up the habit before they reach adulthood, according to the Ash group's director of policy, Hazel Cheeseman. She says the switch to standardised packs in May next year will give children even greater protection, as they will no longer be attracted by "glitzy packaging". However, tobacco retailers are yet to be convinced that banning them from displaying products will have a significant impact on the number of children taking up the habit. Cigarettes and tobacco represent around a third of newsagents' turnover on average, according to the Tobacco Retailers' Alliance. It says the Government should be clamping down on the black market and doing more to stop people under the age of 18 getting their hands on cigarettes, rather than banning the display of tobacco. The Department of Health points at evidence that shows more young people do start smoking if they see tobacco on display in shops. Cancer Research UK's director of cancer prevention, Alison Cox, describes the ban as a positive move. She says every year 100,000 people die because of smoking, so taking tobacco out of people's view can only be a good thing for their health. It will protect young people from being attracted by the marketing methods of companies, she says.